I once asked Mrs Romance if she could only eat one type of food for the rest of her life, which would it be? I was expecting her to say ‘Italian’, but she surprised me with ‘Japanese’. Well, I still think I’d answer with ‘Italian’ and I’ll tell you why. I’m bloody sneaky! 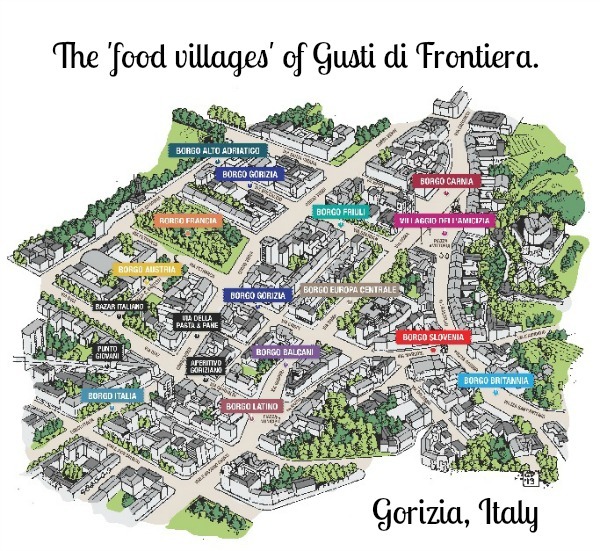 If I ever got bored of eating Italian food (unlikely, of course), I could just head to Gorizia and a whole new food empire would be before me. What or who on earth is Gorizia, I hear you ask. What could possibly offer such an incredible solution to this awful ultimatum? 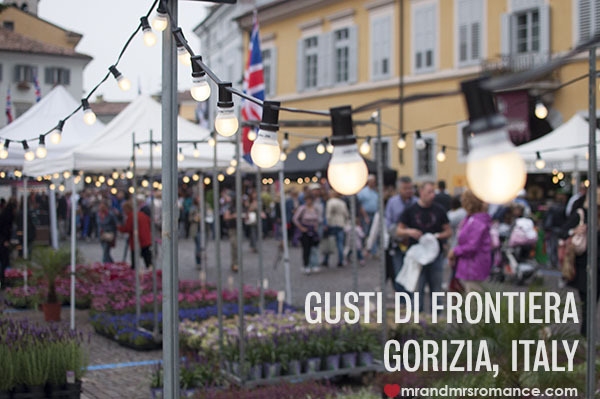 Gorizia is a little north-eastern Italian town on the Slovenian border. In fact, it’s across the border, with a foot in both countries. Its Slovenian name, by the way, is Nova Gorica. But it’s on the Italian side where the magic happens. The last weekend of September sees this quiet, pretty little town transformed into a foodman’s paradise! 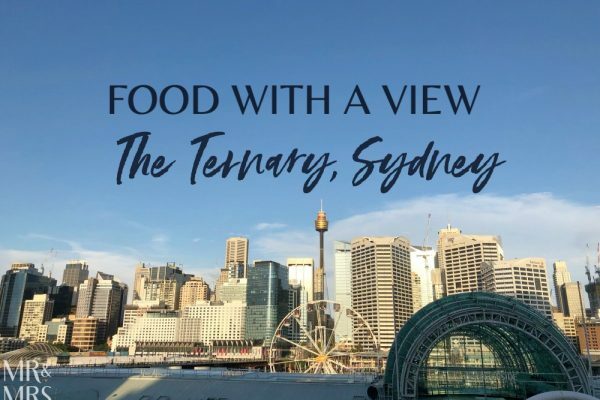 From the last Thursday to Sunday of September, food stalls from around the world appear on the cobbled streets to bring about Gusti di Frontiera – or ‘Tastes of Borders’. Each street becomes a village telling the story of different parts of the globe with the international language of food! We were so happy when our friends Cristina and Daniele said they wanted to take us there. Especially because this was to be the 10th anniversary of the festival. We wandered around the streets breathing in the incredible aromas of food from over a dozen different regions. We were in our element. 20 different countries were represented by over 265 stalls – each one offering food I wanted to eat. It was bewildering in the best possible way. 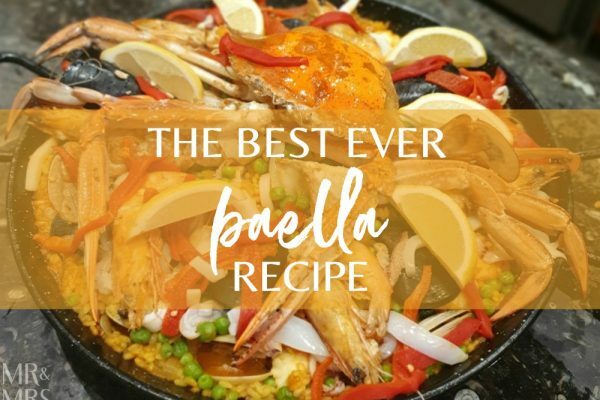 Thankfully Daniele is a man of planning and conviction, and he quickly planned a route through the villages of food so that we would not miss a single morsel. And oh the morsels to try! Let me spell it out – not because I doubt your imagination, more because talking about it makes me happy! The streets were full of bunting and beer tents. There were amazing Calabrese meat stalls from the south of Italy, huge grills with racks and racks of char-grilling ribs from the Baltics. One stall from Croatia had even brought in their own wood-fired bread oven – a huge stone-clad thing hooked up to a trailer. The bread that came out was similar to a Turkish pide – a kind of pizza – and was excellent. There were stalls with piles of olives from the Med, immense parmesans from Parma, peculiar panini filled with ‘milza’ – spleen in English! Giant German pretzels covered in cheese and bacon caught my eye, as did the grappa stall. Grappa is Italian for ‘rocket fuel’ and I love the stuff! In the French ‘village’ we couldn’t help but have some raclette and potato from a proper raclette machine. It grills four halved cheese wheels at once until the cheese is liquid then they just pour it over your herbed potatoes. Unbelievable! And of course, I had to sample a beer or two. Laško is a Slovenian beer and – particularly on a hot food-filled day – is heaven on the lips! But one thing we hunted for everywhere was a creation from the local region: frico. Frico is basically a panful of cheese cooked into a cake. It melts, then goes crispy on the outside but stays gooey and somehow fluffy in the middle. It’s so rich but very very good indeed! And then there was the incredible array of sweets! One place was just an entire stall of tempered chocolate moulded into the shape of DIY tools! You could eat a hammer or munch on a circular saw blade. Brilliant. We even found a Triestino specialty: gnocchi stuffed with plums in a cinnamon syrup! Delicious. 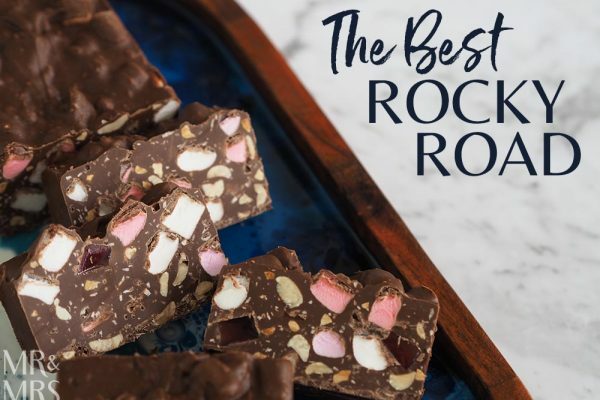 Giant pots of Nutella promised chocolate crepes, what looked like fruit was in fact marzipan, and there were rows and rows of cakes, tarts, biscuits, petit fours… you name it. If you got thirsty, every couple of stalls, there was a beer stall showcasing brews from Germany, Croatia, Slovenia, Italy, Ireland, Spain and of course the Czech Republic. And if you didn’t fancy a beer, you could head to ‘Borgo Latino’ and try the Cuban village’s mojito. Alternatively, you could always visit one of the little wine shops along the way. One place used to be an old apothecary, and was using the old drawers to display their best wine. The festival was on for another two days when we were there, and you could feel the atmosphere building and building. It would have been brilliant if we could have stayed until the Sunday. I have a feeling the finale would’ve been a spectacle. But then again, if we’d stayed there for more than just one day, it would’ve been us people would be calling the spectacle: think people exploding from too much food. If you’ve ever seen Monty Python’s The Meaning of Life, you’ll know what I mean! 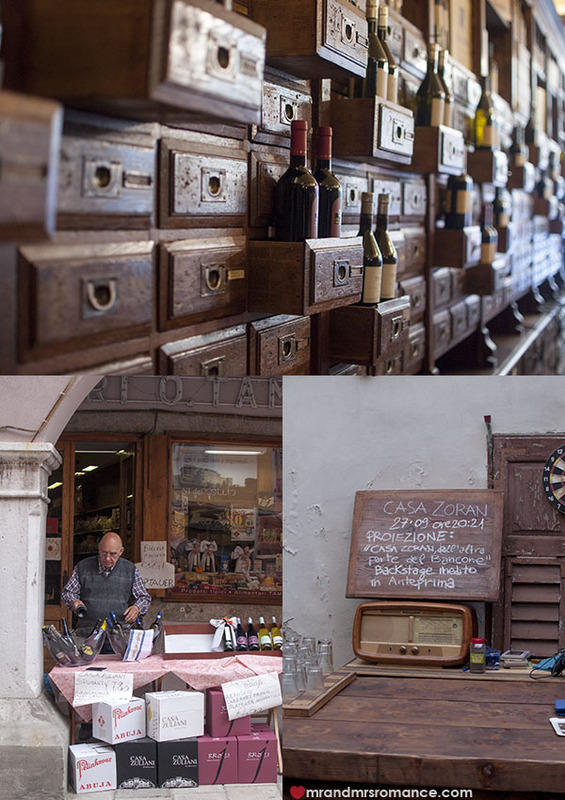 Images by Mrs Romance and map courtesy of the Gorizia homepage. I think I would literally need to be rolled out of that festival. Wow! 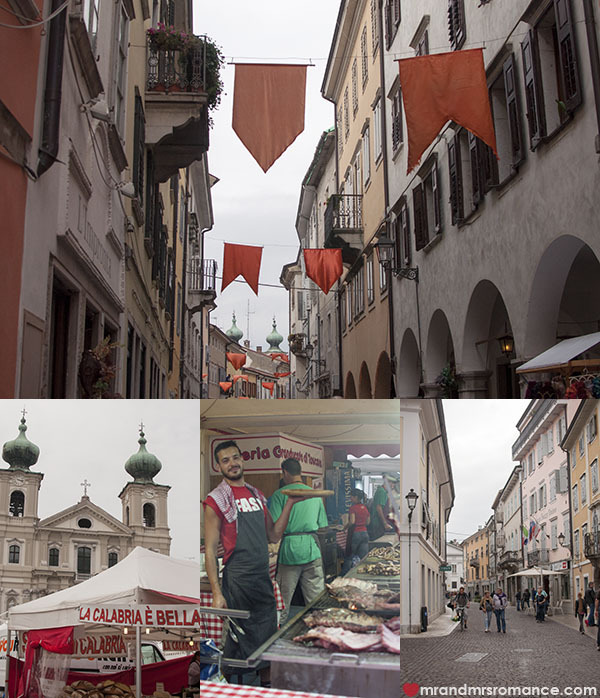 We happened to be in Gorizia for the food festival one year without knowing it was on. Crowds of people were walking past our hotel – we thought it was a football match, but glad it wasn’t. Our favourite was the wine tent -€1 a glass of local fizz. I wonder if the festival is still running? Wow! That was a bit of luck, Richard! We were staying with friends in Trieste at the time and they were champing at the bit to get to the market. I believe it is still going – it was pretty popular, so I reckon they’d be mad not to keep it up. 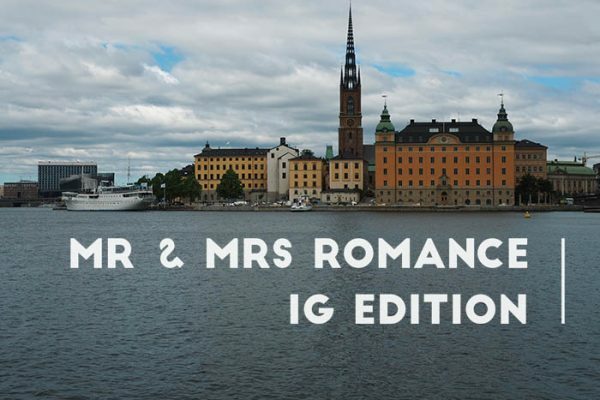 What makes Sweden and Belgium such great travel destinations?